I discovered Mira Schor's writing by clicking on a link on Facebook titled "Just a short message from Venus", which led me to her blog and I was sold. This particular blog post was a reaction to "Why Are There Still So Few Successful Women Artists?" by Ben Davis in Artnet. I so much loved Mira Schor's stance that I will quote it here in total: "My point is that one writes and one writes and one asks why the situation of women artists (and beyond that of women generally) is fundamentally resistant to change despite the paradox of some visible change, and one asks the question again and again. And yet even that discussion, and the vast and important area of scholarship and theorization applied to the work of women artists and to gender representation, does not ultimately penetrate the art market and nor even the upper strata of academia which may have moved on to newer concerns." And there'r many more strong opinions to be found on her blog. Refreshing, isn't it?! About 10 years ago curator Philippe Vergne said on a panel about the 2006 Whitney Biennial, which he had co-curated, that there used to be an art world, then there was an art market, now there is an art industry. I was born into the art world of post-war New York, the one you read about in history books, which was itself composed of several art worlds and artistic communities based on style and ideology, and I am still part of the remnants of that world, and of the ones that I have moved through over my life as an artist--various art families and lineages—people I went to school with, people who were my colleagues, people who were my students, communities of artists, feminist communities. Those are real worlds in that they support the production of work and the circulation of ideas. I sometimes find myself in situations where mostly younger artists seem to feel they are part of a scene and they want to be seen as being part of the scene. I have a bit of distance on that belief structure after a lifetime as an artist. I try to follow the trends in terms of understanding what art is now, what the art world/market/industry/scene is now. It’s not that easy or compatible. The one thing you learn in being an artist for a few decades is that values that seem completely naturalized will eventually be turned on their head, but paradoxically the essence of being part of a scene is thinking it and everything it is based on including aesthetic criteria and even business practices will last, so once you know they don’t last it is harder and harder to believe in the scene or even understand it but because I’m a contemporary artist I do try to understand the art being made and the scene, local and international. But for the most part what is presented in the media as the art world, art scene, art market etc… is something I don’t feel I belong to and I know most of my friends feel the same way. I’m just responding sharply to the word scene, which generally has a negative connotation! To be more specific, I’m a painter with friendships with artists around the United States, particularly in LA where I went to art school and where I am represented by a great gallerist, Clyde Beswick at CB1 Gallery, and NY where I’m from and where I live; I also created a community around me through my writing and my publication of the journal M/E/A/N/I/N/G which I co-publish and edit with my friend the painter Susan Bee: we have been committed to having artists write and participate in the discourse. I occasionally write for The Brooklyn Rail which is a community within the New York artworld (and maybe a scene too but at least it feels organic to me). I’ve taught for a long time and made friends with some of my former students who are now successful artists around the world. I occasionally go to art openings of friends, I lecture and appear on panels in universities, museums, and at the College Art Association. So I live in a nest of interwoven art communities, worlds that share some ideas and histories." 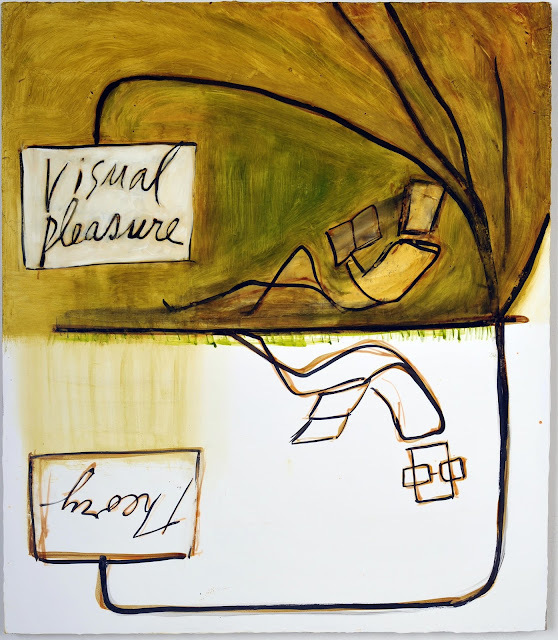 Mira Schor, Reversible Painting: Theory/Visual Pleasure, 2013. Ink and oil on gesso on linen, 28 × 24 in. The “year” obviously has turned out to be a metaphoric and elastic time frame. I have continued the blog for five years though I don’t post as often as I did at the beginning. I tend to use Facebook for quicker appreciations of artwork I like but don’t have that much to say about, so the blog has a certain formality and weight for me, relative to Facebook anyway. But it’s still a great vehicle to be able to express ideas quickly and on my own terms, independent of mainstream publication agendas. Every couple of years I publish a table of contents to help people orient themselves through what has become a pretty huge group of writings on various subjects, including painting, art teaching, film, feminism, American electoral politics, and the conditions of writing a blog. What I like about it is the ability to intervene into discourse immediately—the process of publishing a book with a university press is painstaking and slow, even the process of writing for a major art publication is slower than the time frame of a blog post. I find the pressure of time, of working closer to the news cycle yet being able to put an idea out on your own schedule, has inspired a different way of writing, more experimental and conversational. I love the possibility of hyperlinks; it is a teacher’s paradise to be able to immediately connect someone to information about a reference you make. The downside of the whole blogging atmosphere and ethos is that you are less likely to have the time to write more carefully researched text or to develop and then condense your thoughts over time. It’s too tempting to get it out right away. I explore the conditions of writing for a blog in The Imperium of Analytics. What I’m doing is a kind of hybrid between what is generally thought of as a blog post--quick, short, keyed to the news cycle--and the kind of longer, speculative essays I wrote for M/E/A/N/I/N/G and other publications in earlier years. My posts are longer than average for a blog, they often are not about whatever the mainstream art media is focusing on, though the more popular ones, the ones that go semi-viral are usually about something in the news." "I am a painter. My parents Ilya Schor and Resia Schor were European artists living in New York so I was born into the principal discussions about art in the post-War period in New York. I studied art history in college at NYU; I was involved in the feminist movement as a graduate student at CalArts in the Feminist Art Program where I worked on the Womanhouse project. Based on those early beginning, I have continued to study art history and theory, and feminist art and theory. 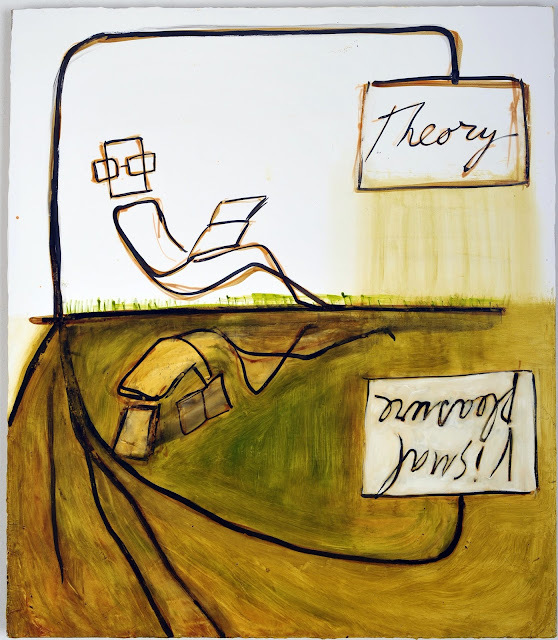 I have been a teacher of fine art since I was a graduate student at CalArts and once I started to write about art in the mid-80s I began teaching theory and art writing classes in addition to studio courses. For years I have worked with the Fine Arts graduate students at Parsons The New School on their written thesis. My writing is based on the reality of this dual practice, as a visual artist and a writer." "I don’t monetize the blog directly. I hate the way those little ads look, at least for my own blog. I do publish my writings, sometimes in books and in art magazines that pay, like Artforum, but often I don’t get paid directly for my writing. I don’t write journalistic art criticism and I don’t write catalogue essays, which are among the ways that art writers make some money. But certainly overall my writing has brought value, I often lecture and teach as a visiting artist and I think the writing has been a big reason for interest in me in that regard, because there are not that many visual artists, in particular not that many painters, that have experience in both fields. As it happens my paintings often represent language, something that long preceded my becoming a writer, so that makes things more intriguing. 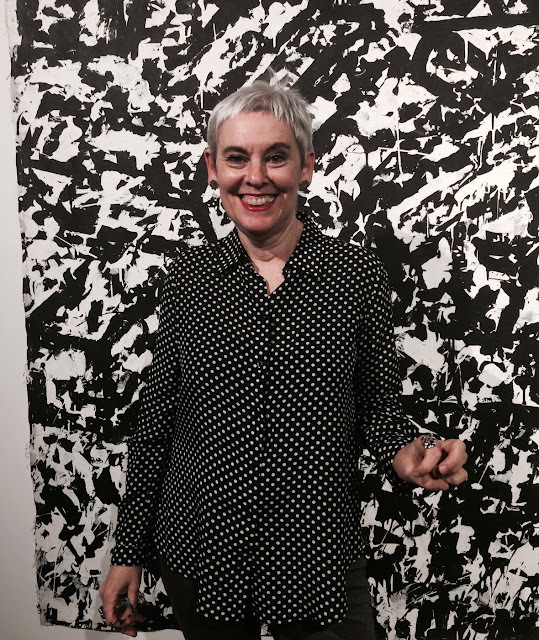 A recent lecture at the RISD Museum focused on this dual practice. The books are great because they are objects, with my paintings on the covers and my words inside, that people live with on their shelves, and the blog is great because it is always there as a resource and can be shared easily which expands my connection to people I wouldn’t otherwise know. Again, not a scene, but a community."